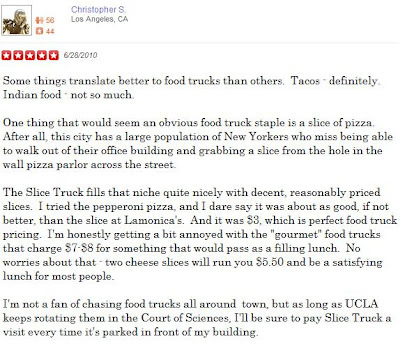 10 out of 10 review from SliceTruck on this review. That's a score of 100%! I will admit its damn well close to impossible to get 10-10 from us with anything less than 5 stars but I want to say the main reason we give this review a 10 of 10 on our review is because its pure refreshment. I'm actually surprised he got a 100% when he referred to our pizza as merely "decent" at one point. No need to argue semantics when clearly this guy gets it. We started a pizza truck because we like a good slice of pizza and figured other people do too. Beside the fact that we think our pizza is better than most pizza in L.A. (or NYC for that matter), we aren't trying to blow any minds away by making Korean shortrib pizza tacos. If you're looking for some sort of fusion, we're not the truck for you. Sure I'd like you to have our pizza, but you're probably too busy camping in line for an iPhone anyway. All we're trying to do is make pizza the way we've always thought of it and make it as great as we possibly can. Truck or no truck. "Pretty good for off a truck", why? what does that mean? Normally I like my pizza made in an oven but these guys bake them in a truck. Sure, putting an uncooked pizza in an over will finish it off nicely but we just put ours in a truck and have discovered that it beats cooking it in a microwave. So I've decided that I rank the best way to cook a pizza in this order, 1. Oven 2. Truck 3. Microwave 4. Steamer. Enjoyed your price commentary also. If we sold Kimchi taco pizza curry, I assure you, they'd be half as big and cost twice as much because that's the price of art. Christopher S. from Yelp, congratulations on a review done well. Notes on other SliceTruck reviews. "For pizza it was pretty decent." -For tuna salad how was it? I was not in love with this truck.....The only reason I am not giving this four stars was the crust. It was probably really good when the pizza was made, but it was burnt after they reheated it for me. -Burnt or charred? Wait, forget it, you don't know what you're talking about. Not too shabby! Still, I wouldn't follow the truck on Twitter nor wait an hour in line for it ...... The best part of my meal was the IBC soda. I got Black Cherry Cream and THAT was definitely the cherry on top. -You're cute considering I'm desperate but I'd rather date your friend. By the way that was a Henry Weinhard's black cherry cream soda that put your cherry on the top. Heading down to Calabasas Commons on Thursday, all the way from Bakersfield, just for this event. Can't wait for a slice (or four!). See you guys there!